Mariano DiLisio and his wife, Caterina Carbone, first appear in Fairport Harbor, Ohio, in 1918. In America, Mariano DeLisio was known as Mariano Delisio. Mariano DiLisio was born on September 16, 1879, at Italy. He married Caterina Carbone, daughter of Pasquale Carbone, about 1911 at Ambridge, Beaver County, Pennsylvania. Mariano died on June 12, 1960, at Brown Memorial Hospital, Conneaut, Ashtabula County, Ohio, at age 80. His body was interred at Riverside Cemetery at Painesville, Lake County, Ohio. Mariano DiLisio, age 20, immigrated to the United States on May 16, 1900. Mariano established residence in Fairport Farbor, Ohio, in 1918. Mariano became a citizen of the United States on September 25, 1924. He resided at 419 Seventh Street, Fairport Harbor, Lake County, Ohio, when he was naturalized. In 1957, after the death of his wife, Mariano moved to Conneaut, Ohio, to live with his daughter Edith Notte. Mr. DeLisio was employed as a machinist for the Diamond Alkali Company of Fairport Harbor, before he retired. At the time of death, Mariano resided at 182 River Street, Conneaut, Ashtabula County, Ohio. 1. 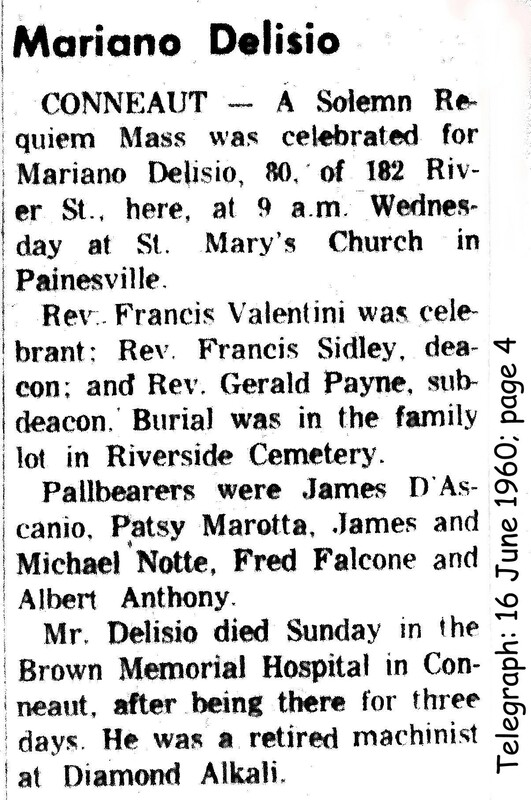 Patsy Delisio was born on November 19, 1913, at Ambridge, Beaver County, Pennsylvania. He married Christina Notte, daughter of Michele Notte and Filomena Zappitelli. Patsy died on July 7, 1979, at Boise, Idaho, at age 65. His body was interred at Terrace Lawn Cemetery at Boise, Idaho. Patsy was a Painesville resident for 34 years, he relocated to Boise in 1970. 2. Edith Delisio was born on July 2, 1915, at Pennsylvania. Edith died on April 9, 1992, at age 76. 3. Jean Delisio was born on May 20, 1917, at Ohio. 4. Albert Delisio was born on May 1, 1919, at Ohio. Albert died on September 24, 1990, at age 71. 5. 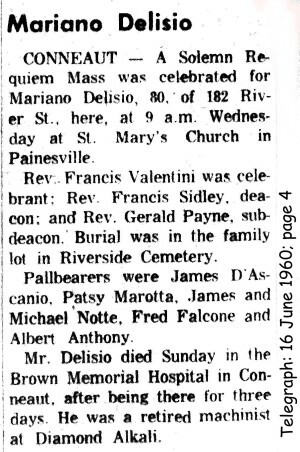 Alfred Delisio was born on July 20, 1922, at Ohio. He married Mary C. Marano, daughter of Michele Marano and Antionetta Bertone. Alfred died on July 24, 1991, at age 69. 6. Mariano Delisio was born in June, 1939, at Ohio.